Size 18 inches x 24 inches. 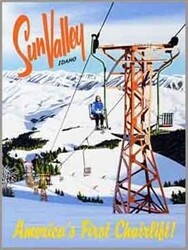 Sun Valley America’s First Chairlift Ski Poster. This single lift was the first chairlift installed in North America and was built in Omaha, Nebraska at the Union Pacific’s Railroad Yards. 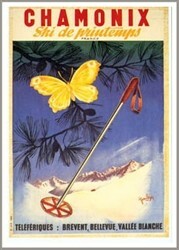 The beautiful Sawtooth Mountains, shown in the poster, are what attracted Austrian Count Felix Schaffgotsch. 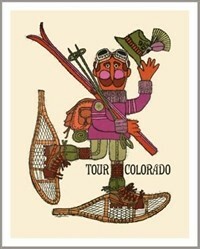 On the orders of Averell Harriman, Chairman of the Board, of the Union Pacific Railroad, the Count had been combing the country, looking for the perfect place to build America’s first full-scale ski resort. 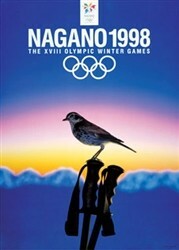 All agreed the area was perfect and Harriman built Sun Valley, which opened for skiing in 1936. Sun Valley was very popular with the Hollywood crowd. The accordion player Andy Brachli represents a tradition that is still present around Sun Valley. Size 18 inches x 24 inches.